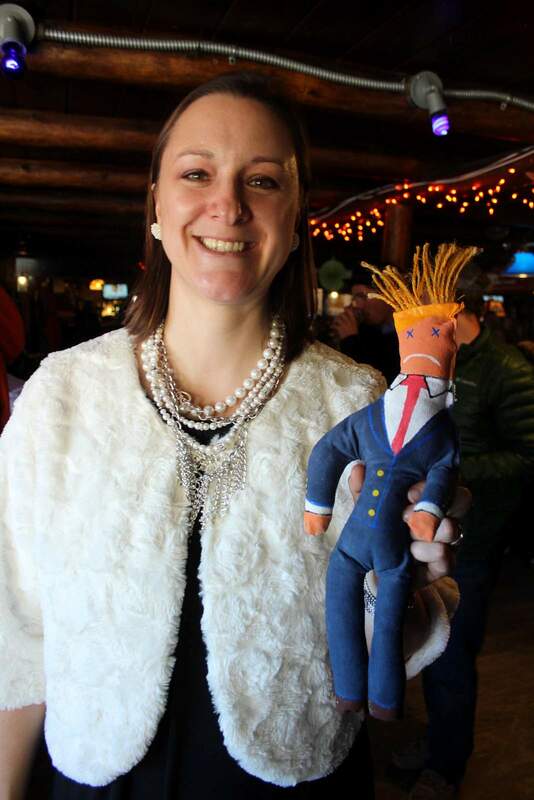 Amber Malarsie, a local artist, created her own Dammit Trump doll for this year’s scavenger hunt. In the annual Snowdown Follies Scavenger Hunt, age matters. Out of 100 items on this year’s list, hunters scavenged hard to find the oldest penny, a Bayfield High School or Durango High School class ring, and a Superbowl hat. The winner was a team of four Bayfield women who work at Energy Inspection Services, with the team name of Diamonds in the Rough. They had 99 items. The one missing article was a Dammit Trump doll, a brand that they were not able to find, so team member Amber Malarsie re-created one by hand. Close, but no cigar, said Judge Shane Aragon. Other team members were Sandra Ollier, Kellie Jaworsky and Jenny O’Conner. The oldest penny dated to 1890. That was used to decide the tie between fifth place. A few items that were hard to find were 1991 Snowdown playing cards, a figurine of the Fry Guy from McDonald’s, and an old Durango Mountain Resort season pass – not a Purgatory pass. Twelve teams took the list of items on Wednesday and paid the $20 entry fee, and 10 brought items back Friday morning. Judges for the event this year were Aragon, Jim Ourganian and Cindy Hemphill. Judging can be persnickety, as well. One item on the list this year was $372 in Monopoly money, and the team had to count out the money in front of a judge. One of the teams had brought in a pack of collectible Monopoly money and showed it to the judge, but didn’t want to open it and reduce its value. That dropped down their count of items. Prizes for the event were cash, liquor, Snowdown memorabilia and other goodies donated by local businesses. “Don’t spend it all in one place, or if you do, spend it here!” said Ashleigh Tarkington, owner of the Billy Goat Saloon, which has sponsored the event for the past few years. One team of young 20-something newcomers was despondent that they didn’t find more items that more experienced teams found. “Did you have a good time?” Aragon asked. “Well that’s all that matters!” Aragon replied. The Billy Goat also sponsored a stiletto heels obstacle course competition on Thursday night, with several brave women and a few guys competing while wearing four-inch (or higher) heels.